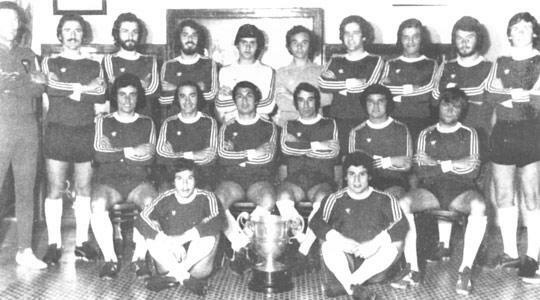 Sliema Wanderers, 1975-76 champions. Back row: V. Scerri, L. Fabri, M. Schembri, R. Aquilina, C. Sciberras, Grech, O. Losco, R. Inglott, S. Tortell. Middle: J. Bajada, L. Borg, E. Aquilina, E. Darmanin, E. Schembri, D. Azzopardi. Front: J.J. Aquilina, G. Camilleri. The 1975-76 league championship had an uncertain start. After each side had played three matches, six teams were leading the table on equal points. A welcome surprise that year was that the two promoted teams, Senglea Athletic and Msida St Joseph, were among the early front-runners. Then, midway through the first round, the balance appeared to sway in favour of Floriana, the reigning champions. They collected five consecutive victories to take sole leadership. It seemed, at this stage, that the Greens were going to run away with the competition. But then, Hibernians came into the picture, handing Floriana their first defeat of the season. Hibs' success gave Valletta, Sliema and Msida a chance to close the gap on the leaders. At the end of the first round, only two points separated the chasing pack from Floriana. At the other end of the table, St George's and Birkirkara seemed sure candidates for relegation. Marsa and Senglea, too, were never very far from the drop zone. Floriana opened the second round with a series of fine performances and, by the third game, only Sliema could keep up with their scorching pace. The Wanderers, after an indifferent start to the season, came back with a bang. They started to win matches until they faced Floriana in what proved to be the decisive game. As expected, a huge crowd turned up to watch this match which produced plenty of thrills but very little good football. In the first half, Sliema were the better team and, without being dangerous, held the initiative for long periods. Just before half-time, the game sprang to life when Sliema were awarded a penalty for a late tackle by Ray Farrugia on Edward Aquilina. Lawrence Borg took the penalty but his shot was too central and Michael Sultana punched the ball away to safety. A minute later Floriana should have opened the score. Ray Xuereb was all alone in front of the goalkeeper, waiting for a pass from Louis Arpa, but the latter stubbornly held on to the ball until it was too late, and the Blues defenders could cover. This lapse cost Floriana dearly because a few minutes later Sliema scored. Borg crossed into the Greens' area. Sultana intercepted and the loose ball fell to Eric Schembri who hit towards goal where Oliver Losco was waiting to tap into the net. Twelve minutes into the second half, Sliema increased their lead. Schembri passed to Ritchie Aquilina who shot home after brushing aside Anton Camilleri's desperate tackle. Sliema were now home and dry and, although Xuereb did score a consolation goal for Floriana, it was the Blues who dominated the rest of the match with intelligent and rational football. The way was now clear for Sliema to win the championship. Floriana kept hoping for a slip-up by their rivals but the Blues did not oblige and secured their 21st league title. As the season progressed, the fight against relegation was restricted to St George's, Marsa and Birkirkara. The Saints, after an indifferent first round, rolled up their sleeves and pulled themselves out of trouble thanks to a string of positive results, leaving the other two holding the wooden spoon.